A rearrangement reaction is a board class of organic reaction where the carbon skeleton of a molecule is rearranged to give a structural isomer of the original molecule. Often a substituent moves from one atom to another atom in the same molecule. One rearrangement pathway where an unstable carbocation can be transformed into more stable carbocation is called hydride shift. 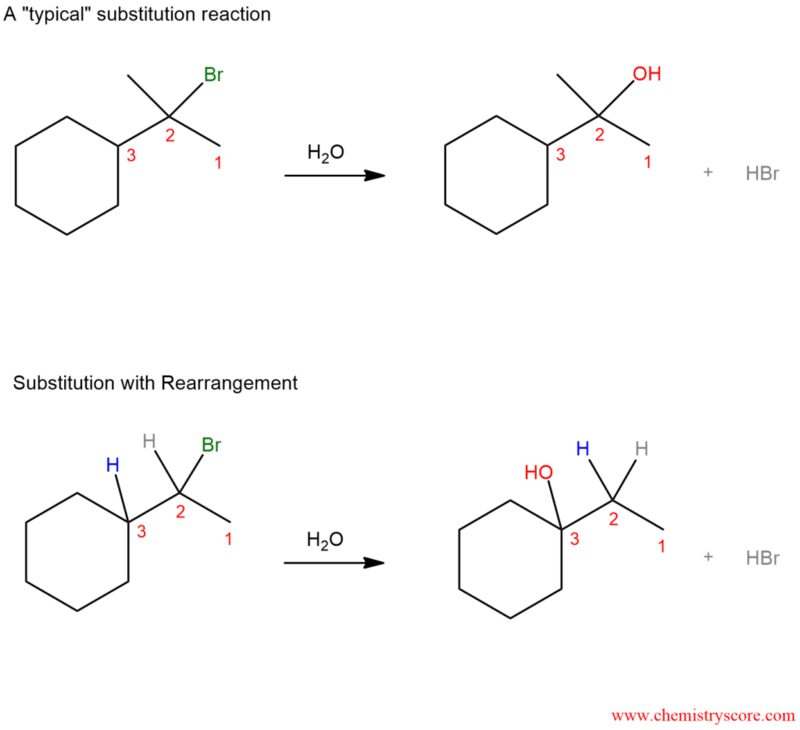 Rearrangement can accompany many of the reactions such as substitution, addition, and elimination reactions. 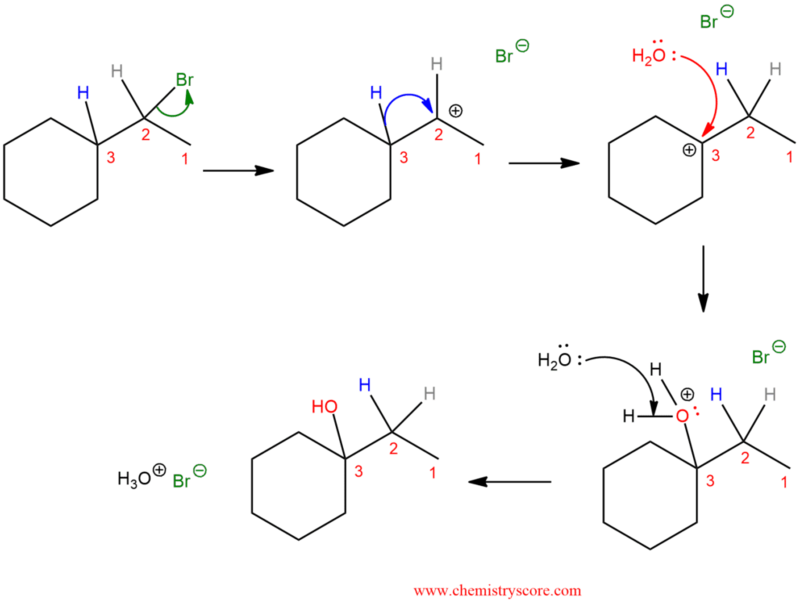 Let’s look at a substitution reaction. In the first case, we have a “typical” substitution reaction: in the reaction of the alkyl halide and water, there is a break of the C-Br bond and formation of the C-OH bond. However, if we change one thing about this alkyl halide – move the bromine to C-3 instead of C-2 – now when we run this reaction we see a different product emerge. It is also a substitution reaction (replacing Br with OH) but it is a different carbon. And this is substitution reaction where the hydrogen has moved. We call these movements “rearrangements”. Reactions that go through carbocations can sometimes undergo rearrangements. The carbocation is a carbon atom with six electrons bearing a positive charge. It is an electron deficient and it needs two electrons to full octet. So it would make sense that carbocation become more stable as you increase the number of electrons donating groups attached to them. Alkyl groups are a perfect example. That is wahy carbocation stability increases as you go from primary to secondary to tertiary. Carbocations are also stabilized by resonance, which allows the positive charge to be delocalized or “spread out” over a greater area on the molecule. If a situation exists where an unstable carbocation can be transformed into a more stable carbocation, a rearrangement is possible. In this reaction, we start from the secondary carbocation and in the transient state, we can see unstable intermediate. There are partial C-H bonds on C3 and C2 from which one will break and the other will be established. Thus, we end up with a carbocation on C3 because tertiary carbocation is more stable. As we can see, we always go from less-substituted carbocations to more substituted carbocations. In the last case, rearranging is advantageous because the new carbocation is stable. 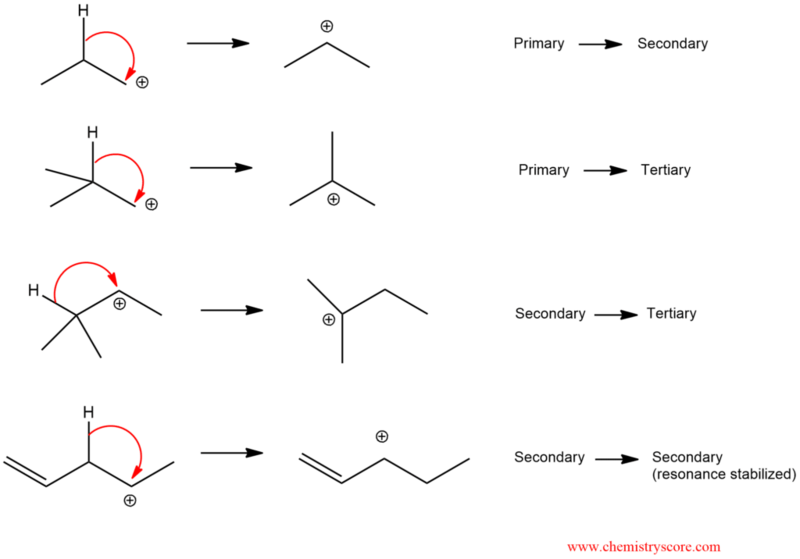 As we can see, in the step, after leaving the leaving group, we get a secondary carbocation which is not stable. Therefore, a rearrangement can occur to give the more stable tertiary carbocation, which is then attacked by the nucleophile (water in this case). Finally, the water is deprotonated to give the neutral alcohol.